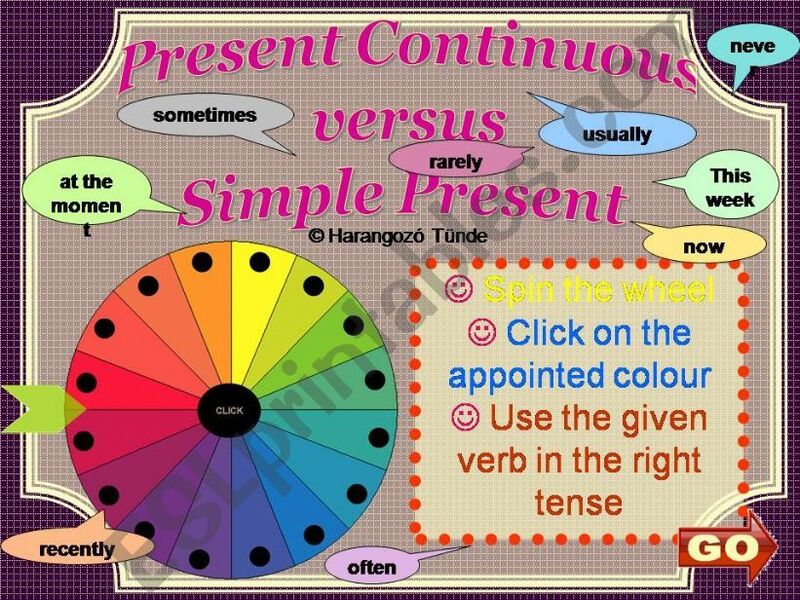 Wheel game about the use of these two present tenses. Spin the wheel, click on the appointed black dot and decide the right tense in several sentences. Gap filling exercises with given verbs. Click and check your answers with the solutions and go back to the wheel. Just have fun!! Thanks for this great game!!! how do yo do it??? Super work, many thanks for sharing. Well, of course FANTASTIC. Typing mistake. Thanks again. Well done and useful!Thanks for sharing! Nice work!!! !Thanks a lot for sharing!!!! Excellent work! Thank you so much! I am spechless!!! This is really nice! Thanks a bunch! I am sure my students will enjoy it! You did an amazing job! Thank you so much! Thank you so much, very creative! That will be great practice for my students! This was perfect for review! Thank you!